I’m no journalist, just a guy trying to stay sane via the dubious, possibly even insane, route of clinging to his childhood baseball cards, so don’t take this or anything else I ever say as unassailable fact, but I believe that at a certain point in his lengthy major league career, well after he had become established as a regular presence in the major leagues, Enos Cabell became a tool used by a then somewhat obscure baseball writer and analyst named Bill James to, first, attack the idea that Enos Cabell should be a regular presence in the major leagues and, more generally, to attack the established parameters for determining the relative worth of a major league player. Enos Cabell, James argued, was, contrary to the general consensus on the matter, in fact pretty worthless. I don’t think James had anything personally against Cabell, but he did have a seething, avenging hatred toward ossified conventional thinking, so he battered Cabell pretty mercilessly as he slammed the idea of the tall, thin infielder against the norm of what, in baseball, and by extension in life, is good. Enos Cabell, James concluded, is not good. The implied big question in this Seige on Enos: What is good? I wasn’t aware of Bill James during the years I collected baseball cards, or for several years after I stopped collecting. At the time I got this 1978 card, I would only have been able to draw from a couple of sources in determining where Enos Cabell stood in my world. (I almost wrote “the world” instead of “my world,” but when you’re a kid, the world belongs to you. Even though this thought is occurring as a parenthetical aside, it is probably the thesis of this sloppily conceived essay, if not the thesis of my entire ongoing-until-the-graveyard experiment in baseball card worship and solipsism and nostalgia and anti-nostalgia and the attempt to hold onto joy. When you’re a kid, the world belongs to you, and then little by little you lose it. This is my attempt to reclaim, card by card, my world.) One source in determining where Enos Cabell stood in my world was this card. On the back, the statistics for Cabell’s latest season suggested he was good. He had batted .282 with 36 doubles, 16 home runs, 68 RBI, and 101 runs scored. That, I would have concluded, is good. On the front, he is smiling, happy, a glimpse of the blaring rainbow colors of the Astros visible on his chest. This happy portrait brings me to the next source in determining where Enos Cabell stood in my world: he had appeared before my eyes, on screen, tall as a two-story building, in the very same uniform and with a similar happy expression the summer before in The Bad News Bears in Breaking Training, a throwaway sequel that I nonetheless and without shame or irony loved and still love. I am not going to venture too deeply into that movie at the moment, even though it is on my mind constantly as I work on a short book about it. I have been watching it on a fairly regular loop, and have watched some scenes as if I’m dissecting the Zapruder film. One of those scenes is the appearance of the Houston Astros in the dugout being used by the Bears. Bears’ third baseman Jimmy Feldman (played by Brett Marx, grandson of Gummo and lookalike of grand uncle Harpo) announces the arrival by exclaiming the names of the Astros’ stars, Cesar Cedeno and Bob Watson (the latter the only Astro who gets to speak a line; it’s the most crucial line in the movie, or, if you’re me, in movies in general), but besides Watson and Cedeno there are several other Astros who amble into the scene: Bill Virdon, Ken Forsch, JR Richard, Joe Ferguson, Roger Metzger, and Enos Cabell. Most of the Astros fade into the background, taking a seat on the bench, but Cabell is shown reacting with glee and pointing as he watches Tanner Boyle elude officials trying to grab the Bears shortstop and drag him from the field. Like I said, I’ve been watching the movie constantly, which has a way of pounding all the enjoyment out of a thing, but I still get choked up by Tanner’s Last Stand. I don’t have the time or inclination to get into that now, but I do want to say that Enos Cabell deserves credit for shepherding that moment along by his enthusiastic reaction. While Ken Forsch, for example, sits idly by and dispassionately watches the little boy fight for his life (for what is life without baseball? 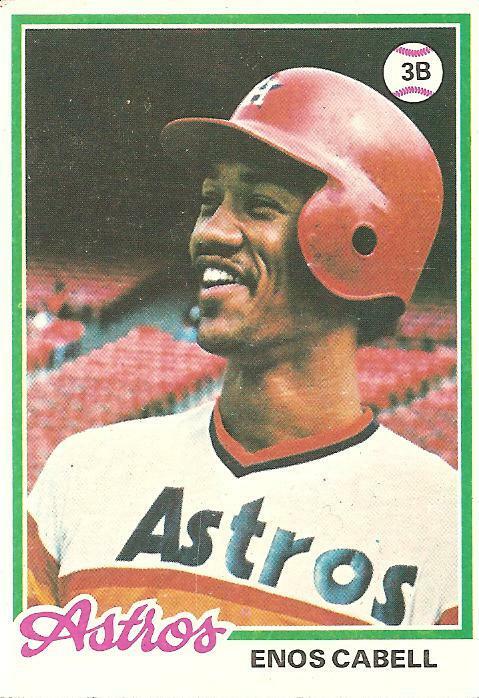 ), Enos Cabell points and laughs, the first among anyone in the entire Astrodome to become a fan of Tanner’s tenacious elusiveness. Soon enough, buoyed by Bob Watson’s one line (“Hey, let the keeds play,” Watson drawls, accompanying the somewhat stiff line-reading with a mistimed, limp-fisted air punch), Coach Leak will exit the dugout and in his Nam-Vet-suggesting army jacket he will begin exhorting the crowd to also become fans of the spectacle and of what it means. Soon enough, Kelly Leak, that stubborn non-joiner, will stand beside his estranged father outside the dugout, the two of them chanting “Let them play” (goddamnit, I vowed not to get too deep into this today but here I am again in the middle of the greatest fictional political movement of my world) and then soon enough all the Bears will join them, and then soon enough the whole stadium will be chanting, everyone shedding their indifference. It all started with, or was at least nudged forward by, Enos Cabell, rainbow-bright major league athlete and fan. So in my world, Enos Cabell is good. This isn’t my world, of course. I’m just passing through. My only claims are those of a fan. I’m a fan of baseball. I’m a fan of homely forgotten movies. I’m a fan of Bill James, but I don’t want to (and never could) follow in his brilliant footsteps. I’m a fan of the statistics on the backs of my old baseball cards, but I know they don’t tell an accurate story of a player’s accomplishments. I’m a fan of fans. Each fan owns the world as much as possible by way of his or her distinct point of view. Each fan remembers. Each fan cares. Each fan sheds indifference with weird, inexplicable love. You are currently browsing the archives for the Enos Cabell category.